The Albany landfill will be full by 2023. 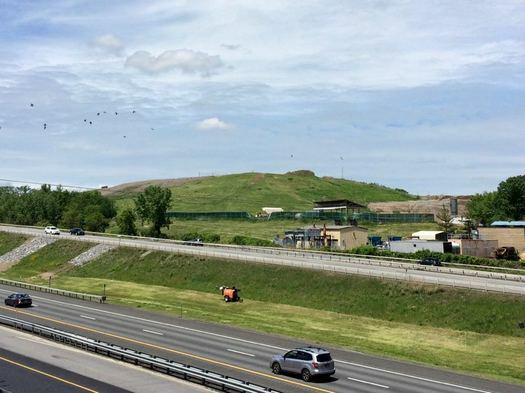 The Albany landfill is set to close by 2023, according to the most recent estimation by the city. And when that happens, Albany will have to find a new place for its trash. That impending deadline has city officials thinking about what comes next -- where the garbage will go, sure, but also how it's collected from the city's thousands of households. This is an issue that effects pretty much everyone in the city. And time is running out. 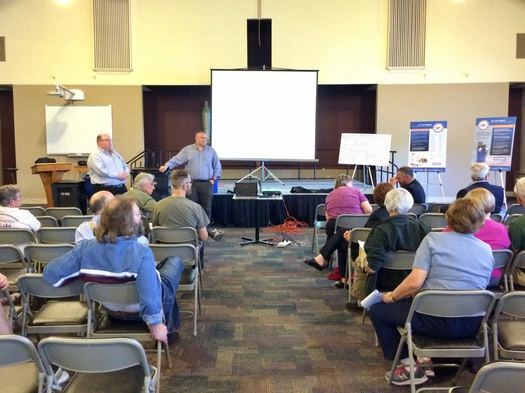 As city officials explained at a recent public meeting -- and will talk about again at a handful of upcoming meetings -- they have some ideas about how things might go. For example: A switch to a system in which people pay for garbage service based on how much they throw out is almost certainly part of the future. But there are also a bunch of questions, and the city is hoping people will have some thoughts about how to answer them. Where will the city's trash go after the landfill is closed? That hasn't been determined, but the likely answer is that it will ultimately end up at a private landfill operation in western New York or somewhere out of state. But there's also the issue of where the trash goes before it makes it to that (some other place) landfill. City officials are currently looking at the possibility of building what's called a transfer station at the landfill site on Rapp Road. The city has a draft request for proposals posted right now that walks through the potential outline of such a facility. The short version: The transfer station would serve as the point where city garbage trucks dump trash that's been collected from around the city, and the trash and recyclables would then be gathered up and placed on larger trucks -- or even a train -- and shipped elsewhere for landfilling and processing. The facility could also possibly serve as a "one-stop" site for residents to drop off electronics, bulky items, or other unusual garbage items. City officials say they want feedback on the potential plan for the transfer station, and the city is collecting public comments through June 19. Also, if you're curious about this topic, the RFP includes a bunch of bits about trash collection in the city. Example: The Department of General Services collected 25,677 tons of residential waste from an estimated 22,000 properties in the city in 2015. What is trash collection going to look like in the future? The specifics of the city's next garbage system haven't been worked out yet -- that's the point of the whole process that's going on right now -- but it will almost certainly be a significant change from the current throw-out-however-much-as-you-want setup. The city will probably have a setup in which households are charged more if they throw out more. The industry term for what this kind of arrangement is "pay as you throw." And it can be set up a few different ways. 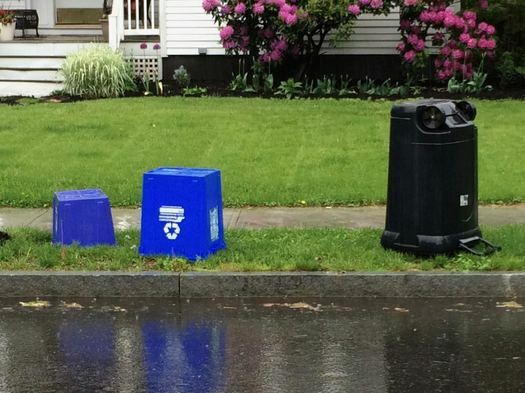 The city could issue households a series of standard-size trash totes -- small, medium, or large -- charging a different annual price for each size (and charging extra for throwing out more than what can fit in the tote). It could also use a system in which households are charged by the bag of trash. That would involve the city selling special trash bags in which all garbage would ultimately have to be placed curbside, or it could sell stickers that people could attach to trash bags. As city officials explained at a public meeting at All Saints last week, the first of the series of public meetings about this topic, the future setup will probably end up being some sort of hybrid program that uses totes and designated stickers/bags because of the diversity of neighborhood layouts around the city (more on that below). What's fair -- and effective? The meeting at All Saints last week. One of the central questions that the city -- and its residents -- have to address in figuring how the next trash system works will be what setup is both fair and effective. At the All Saints meeting -- and in other recent public comments -- mayor Kathy Sheehan has acknowledged the fee is unpopular. And she's pointed to the need to find some sort of general agreement about what people think will be fair in the next system. So: Is that a standard annual fee that's assessed to every property in the city that's a user of the system? Is it a standard fee for every housing unit? Is it a fee based on the size of bin a household uses? Is it a base fee plus some sort of per-bag fee? Should fees fall on property owners or directly on tenants? The flip side of this particular issue is how are people going to react to the incentives in the new arrangement? To grossly oversimplify things, if the city starts charging people more for throwing out more garbage, some people will react by trying to recycle more, composting more, and otherwise being more conscientious about the amount of garbage they produce in an effort to save money. Others will just shrug and pay the extra fee. And others... will try to find ways around the system. That potential problem of people responding to the new incentives by illicitly tossing trash came up at the All Saints meeting in the form of a point made by a resident who said he remembered the situation the city was facing when it instituted curbside pickup in the 1970s -- mainly, that people were tossing trash all sorts of places that they shouldn't. So, are people willing to have a system in which maybe everyone pays a little bit more -- say, with a higher standard fee for each property -- to ensure that incentives are aligned in a way that people are more likely to comply? It might not come down that -- maybe everyone will be conscientious. But it's something the city has to think about. This is something the city is trying work out as it studies what to do. But the short answer is: more. Here are some rough numbers to give you some sort of frame of reference. + It costs the city about $216 per ton of garbage for collection and disposal. + Each property in the city of Albany produces an average of 1.5 tons of trash each year. + So it currently costs the city about $324 per year per property for trash collection and disposal. After the meeting, Giebelhaus estimated the city will probably be looking at a per-ton cost of approximately $250 after the landfill is closed. So that's about $375 per property. Again, nothing is certain at this point. But that's a rough frame of reference. Can Albany be more efficient about the way it picks up garbage? 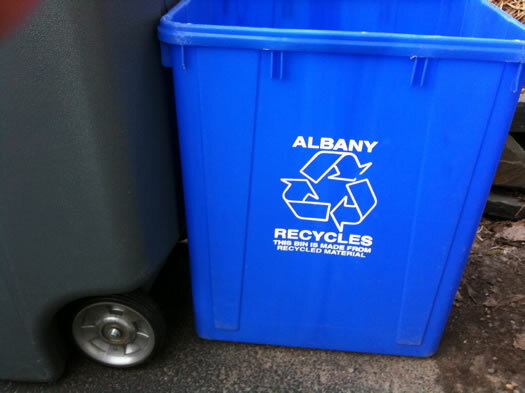 As mentioned above, the city of Albany began curbside pickup of garbage in 1974. And city officials say not much has changed since then in the way the city performs the service -- the methods of picking up the garbage, the routes that trucks follow, everything is pretty much the same. So the city is currently in process of collecting data about trash and recycling pickup in an effort to find efficiencies. One example: Joe Giebelhaus said the city is hoping to feed new data on the amounts of trash collected on various pick-up zones into software that aims to optimize the routes, which could help the city better balance pick-up days and save money on fuel. A demo of the automated truck from last summer. Giebelhaus said the city has already found out that the automated recycling truck can handle pickup at more properties each day, and the city is planning to expand the current pilot program to another 1,100 pickups. These automated trucks won't work everywhere in the city. They require that the bins sit right along the side of the street and not be blocked by parked cars. But Giebelhaus said the city might be able to use a mix of automated trucks, semi-automated trucks (in which workers wheel totes over to the truck and the truck does the lifting), and the current lift-and-throw collection in use now. By the way: The automated trucks don't need full three-person crews like the trucks the city currently uses. But Giebelhaus said he didn't expect anyone to lose their job if the city expands its use of automated trucks because DGS is routinely pulling people from other crews to fill out trash collection crews. Recycling isn't free. 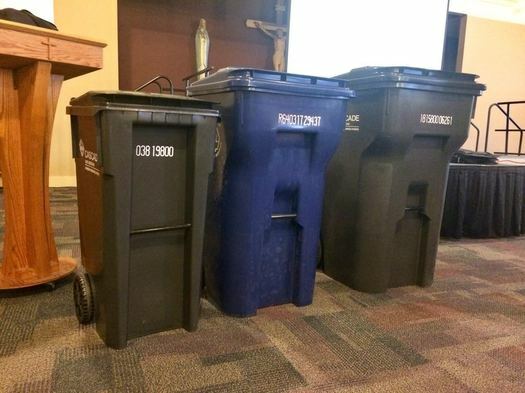 Frank Zeoli told the crowd at the All Saints meeting that the city's current program has costs of $620,000 a year, and the city makes $32,000 a year off recyclables (though that number fluctuates based on the market). But it costs less than throwing away garbage. So, how much more can people in the city recycle? As Giebelhaus and Zeoli explained, of all the stuff the city picks up -- household trash, recyclables in the 22-gallon blue bins, scrap metal, yard waste, and so on -- about 50 percent is diverted from ending up in the landfill. The city has a goal of reaching 65 percent. One area where it could probably do better is getting people better at sorting their recyclables into the blue bins. The city estimates that only about 11 percent of what people typically throw out in the household garbage ends up going into the recycling bin. The automated recycling truck pilot points to the possibility that people can, and want to, recycle more. Zeoli said that people using the new 64-gallon totes have been recycling 50 percent more stuff. "We've had very few people that said they don't like their cart in the pilot," he said. "In fact, we get a lot of phone calls, 'When am I getting my cart?'" Another part of this the city will probably be looking more at is enforcement of the recycling mandate. Those new recycling totes include RFID chips that allow the city to collect data about when they're picked up. And Kathy Sheehan said at the meeting the city can use that data to monitor who isn't setting out a bin, and then contact them to find out what's up and whether there's some issue. "We want to use a carrot first," she told the All Saints crowd. "Our approach has been, we want to do as much education and outreach as we can to get compliance, and then -- and only then -- do we potentially want to use the stick." How open are people to change? Any sort of change in a big system like a city's trash program is going to be hard -- there are going to be new things for people to learn, along with costs and complications. And that might be especially true in Albany because the current all-you-can-throw system of trash pickup is pretty easy on residents. So how open will people be to change? We talked about that angle a little bit with the mayor after the meeting. "I look at this as an opportunity to shift our relationship with garbage. When you have this mentality that it's free and you can just put it out on the curb, I think it encourages behavior that we know is not good for our environment and not good for our community long term," she said. "So this type of change -- while not everybody may like it -- ultimately is going to drive better behaviors, different decisions, around throwing things out and just putting everything and anything on the curb. We need to recycle, we need to be composting, we need to be doing all of these things. So hopefully this conversation will get people thinking along those lines." Meetings start at 6 pm. City officials say they want feedback. So these meetings will be a prime opportunity to give it to them. What time are the meetings being held? I just got the bill in the mail for my rental units - one unit has been empty and I had to hire Junk King to clean it out after the last residents (the city refuses so many items!). The second, the tenant throws out one plastic grocery bag per week and composts the rest at Radix. The third throws out everything but the kitchen sink! There's no way to put a standard fee on tenants' behaviors and if people don't pay their rent on time, there's no way they're going to pay a separate trash fee to me on time or ever. Editors: The meetings start at 6 pm. Now updated above. The city should consider charging by how many cans of a uniform size are put out. As long as people are fiscally insulated from the actual cost of their actions they will not make major changes to their behaviors. Waste to energy incineration. Look at examples around the world where this is successful. The tech is better and cleaner now.